The choice of Leak is revealing. His work rarely punctures any balloons of the powerful. In this case he chose to promote the issue of parenting when the news event concerned abuse of kids in detention by the warders. The Oz runs agendas, it does not promote debate. Spot on. The Australian has a right-wing agenda so appalling it’s unreadable. Politicised rubbish like this, pretending to be news, belongs in the era when Murdoch was kingmaker. I met Bill at the beginning of his career — at his first exhibition of mostly leftie political stuff. What the hell happened? Did the Australian radicalise him? I look forward to Leak producing a cartoon reflecting the late-night alcohol-fuelled violence in Sydney, just as a cultural counter-point. The campaign does what it does pretty well. 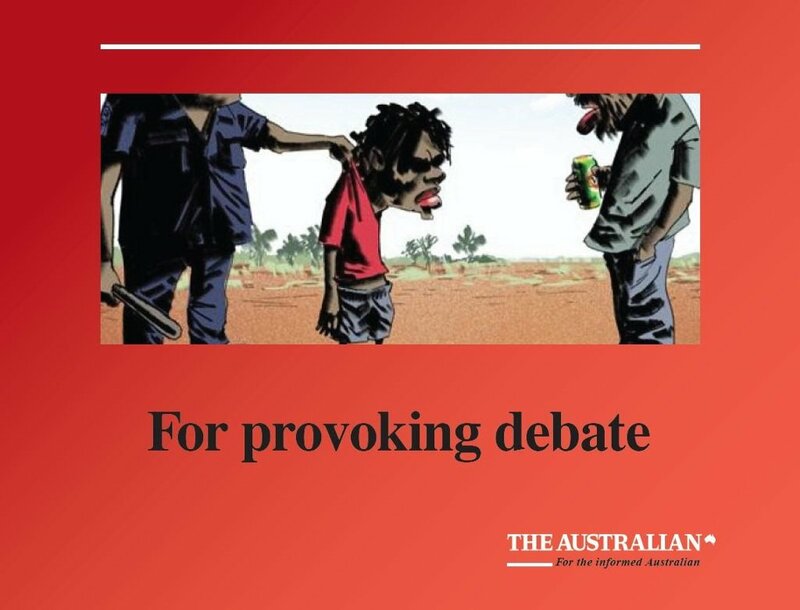 Personally I’d feel pretty sick if I had to work on such a publications so awful it thinks Bill Leak or his work has any place in proper debate. Few publications have done more to dumb down and discredit journalism that The [Un]Australian and no amount of advertising will fix it. shame that commenters up above feel the need to let their leftist agendas towards the brand colour their comment about the merits of the campaign. Yeah, how dare people bring politics into an assessment of this campaign that’s all about their politics. When a paper and it’s owner fire their right wing agendas aggressively towards the public in a way that intentionally misinforms, and intentionally aims to build hatred and division – how can politics NOT come into it? I’m all for people expressing their political opinions regardless of side, but that has to go both ways. In the news print media today you pretty much get one mans opinion forced onto you, that isn’t debate, that isn’t decoding, that isn’t factual. Which one man forces their opinion on you in The Oz? Phillip Adams? Peter van Onselen? Graham Richardson? Paul Kelly? Yeah, because The Australian is renowned for its diversity of views – unless right-wing, more right-wing, incredibly right-wing count!